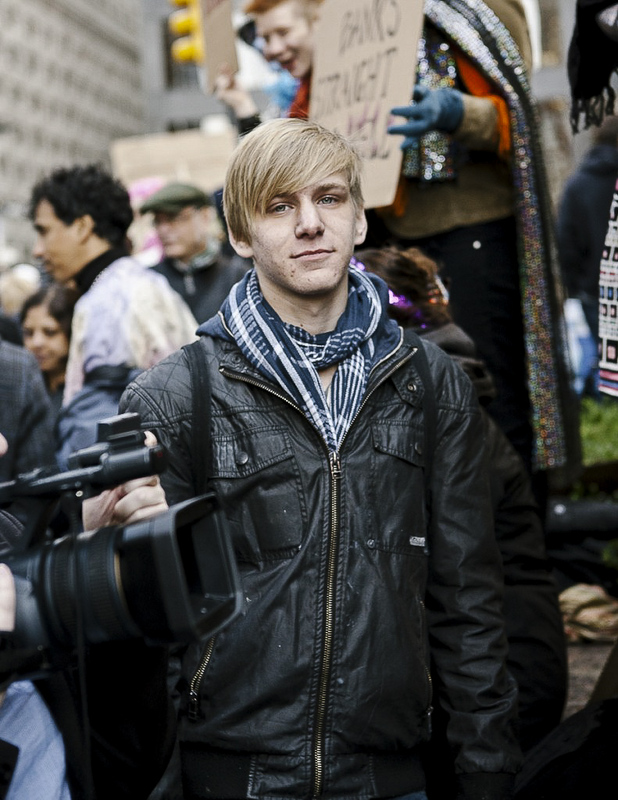 A teacher at Pratt didn’t think there was enough of an openly queer presence at Occupy Wall Street, and we wanted to show that’s not the case. That’s why I was under the rainbow banner at Zuccotti Park last week, chanting, “We’re here, we’re queer, we’re not going shopping!” The 99 percent includes everyone, including us. Occupy Wall Street has been the biggest thing I’ve ever been involved in. I’ve always been ultra-liberal and wanted to get more involved with activism, but there were never things going on around us. I helped with phone-banking for Obama, and I was involved in queer activism at my high school in Baltimore. My high school had a Gay-Straight Alliance, and the Westboro Baptist Church protested us. No one knows why — they do it kind of arbitrarily — but it brought the school together. The school did a huge counterprotest. But life happened, and activism didn’t feel like the priority. I first got really involved in Occupy Wall Street the day people got arrested on the Brooklyn Bridge. I just went to photograph it, and we thought we were going to be fine. Then we were walking too far. We just ran and got off, so we wouldn’t get arrested. After that it started to feel more real. I’ve been going down to Zuccotti Park at least once a week. Me and my friends go there and yell so loud and so much, I’ve been losing my voice a lot. I’m trying to get other people active and not feel apathetic towards it. I’ve been beating myself up a little bit for not going more, but midterms happen so I can’t go as much as I want. I plan on going until it’s over, and hopefully it won’t be over for a long time. I don’t want it to fade away or be shut down. A lot of people I know are very critical of Occupy Wall Street because they don’t seem to understand. People think it’s a group of lazy hippies who want to sit around in drum circles. But you see people of all different ages. A lot of people want to influence change. At Pratt, we started a group inspired by Occupy Wall Street. We have general assemblies. We had the student walkout and march. Pratt’s a good school, but it has problems. A lot of us have issues with where the funding goes. My family’s fairly financially secure now, but we’ve been in a situation where my parents were separated and my mother wasn’t working. A lot of people struggle and can’t get out of their situation. It doesn’t work that way, that everyone has the same opportunities as everyone else. I have an $18,000-a-year scholarship to Pratt, but I go to an expensive school and all my other costs are student loans. It’s all money we’ll have to pay back. I want to be an artist. I study figurative oil and printmaking. It’s essentially the only thing I’ve been able to see myself doing. Almost all the time I think, “What the hell am I going to do? Should I switch to a different school? Should I switch to a more commercial major?” But I think I’m good enough that it’s going to work out.